This is for 1 M256A1 detection unit. The M291 Skin Decontamination Kit is used for removing NBC CBRN contaminates from the skin in the field. These New old stock M291 Skin Decontamination kits have a manufacture date of 2008. 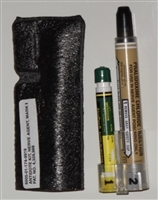 One kit consists of six M291 decon swabs and a carry sleeve they fit into. Military surplus. 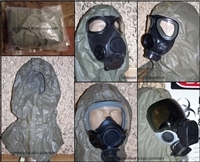 Note: Gas mask illustrated is not included, for demonstration only. 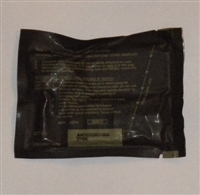 Military Surplus M295 Individual Equipment Decontamination Mits, 10pk (used to be 4pk, now 10pk at the same price!) The M295 kit is used to decontaminate personal field equipment. M295 manual states that the M295 mits can be used on skin for decontamination in absence of M291 Skin Decontamination kit but the M295 decon mits may be highly irritating to the skin. 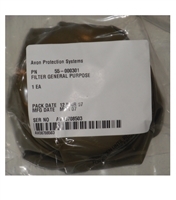 These M295 Individual Equipment Decontamination mits are military surplus, sold as collector's / novelty items only. Packages are sealed, new old stock. Mask not included, used as prop only. This tool is required to change the filter plug on AVON masks M53, FM53, C50, PC50 or others using the standard 40mm NATO threaded port and are dual ported masks. Made of high impact resistant plastic and a must have item if your mask is dual ported. 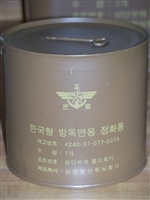 The AVON CTF12 Riot Agent Canister is designed to protect against commonly deployed riot control agents, such as CN / CS gases. These filters should not be used in place of NBC / CBRN filters as they would quickly become over saturated. 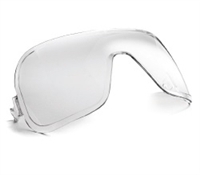 These filters are small, lightweight and perfect for riot control situations. 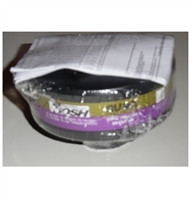 Brand new, sealed and within expiration date. The AVON Sunlight Outsert quickly and easily attaches and detaches from the mask even while the mask is in use. The sunlight outsert can be useful in the outdoors during bright days or even indoors when using extremely bright lights to blind the suspects...etc... This outsert is compatible with the AVON Models: M50, FM50, M53, FM53, C50, PC50 and possibly others. SOLD DOZENS TO HOLLYWOOD STUDIOS, PERFECT MOVIE PROPS.